Based in Cape Town, Portland is part of the Portland Group of companies, which primarily focuses on the construction industry. The company produces quality aggregates from the natural Malmesbury Hornfels deposits in its 65-hectare quarry in Durbanville, and also provides a range of concretes to large construction sites, shopping malls and office blocks, as well as to residential properties and low-cost housing projects. In 2008, it expanded its operations to include manufacturing, installation and transport of precast hollow core slabs, which it handles through its specialised Hollowcore® division. Today the family business, which is celebrating its 30th anniversary in 2018, owns a total of 27 FAW trucks. Each of these vehicles is supplied with a full maintenance contract, which FAW Cape Town takes care of. While the company was the first in the city to take delivery of a FAW 33.420FT recently, the first batch of FAW trucks it ever bought took place some eight years ago. It is now on its third buying cycle with FAW. Apart from the quarry, Portland also run a number of FAW 28.380 FT 6×4 truck tractors with flat deck trailers up and down the Cape Peninsula with payloads of up to 28 tonnes, and GCM of around 63 tonnes. Heyns initially bought six FAW 28.380FT’s equipped with flat deck trailers, as a trial to test FAW and its products first-hand. “I was left impressed after analysing the fuel consumption figures and calculating the parts and maintenance costs. FAW’s warranty promise and level of service back-up confirmed my decision – that’s why the entire fleet has been converted to the FAW brand exclusively,” Heyns explains. While most of its ready-mix vehicles do not drive long-distances, the terrain in the company’s quarry is steep with long inclines and, therefore, highly demanding on the vehicles that operate in it. In addition, ready-mix concrete cannot be left to harden inside vehicle drums. Concrete is, in fact, a delicate product to both handle and transport and complete vehicle breakdowns are completely out of the question. This is partly why Portland has adopted a strict truck renewal policy which sees it trade in its trucks every three years for brand new vehicles. This ensures that maximum uptime is achieved. Truck maintenance is set at 300-hour intervals, with the FAW trucks working 12 hours per day, five days a week. Apart from the full maintenance contracts, FAW Cape Town provides the company with an on-site technician, whose job it is to sort out minor electrical issues and the like, as they occur. Portland has become well known in the province for its impeccable fleet of mixer trucks, which are always clean, and in pristine condition. 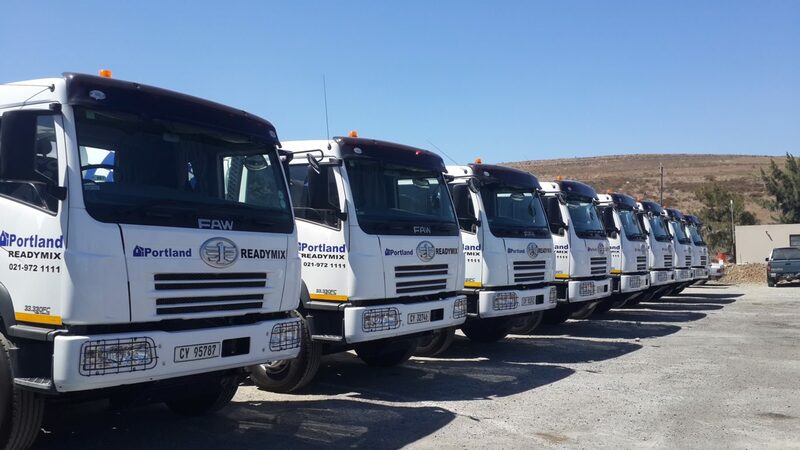 Apart from creating an impressive corporate identity, its strict maintenance procedure means that the demand for used Portland trucks is extremely good in the Western Cape, due to the fact they are so well looked after. Heyns explains that he first heard about the FAW brand after reading up about the company. Back in 2014, Portland and other key FAW customers travelled to China to visit the FAW drum and engine factories for themselves. This visit drastically changed Heyns’ opinion of Chinese trucks and the quality of Chinese products in general. “FAW are also prepared to listen to us in order to solve our problems. We have given them input on the trucks and they have responded to this feedback positively,” he says. A Chinese FAW delegation was later sent to South Africa to view Heyns’ vehicles and make technical changes as per his unique requirements. Over the years Nico and the Heyns family have enjoyed a cordial relationship with Vernon Rudman, dealer principal at FAW Cape Town. Rudman visits the company frequently and has celebrated several milestones with the Heyns family. “FAW Cape Town and Vernon are always available and willing to help us. As customers, we appreciate that we can speak to senior management if needs be. Usually this is not necessary, as FAW Cape Town is perfectly capable of handling any concerns we may have. Overall, we have an excellent working relationship with each other,” Heyns confirms.